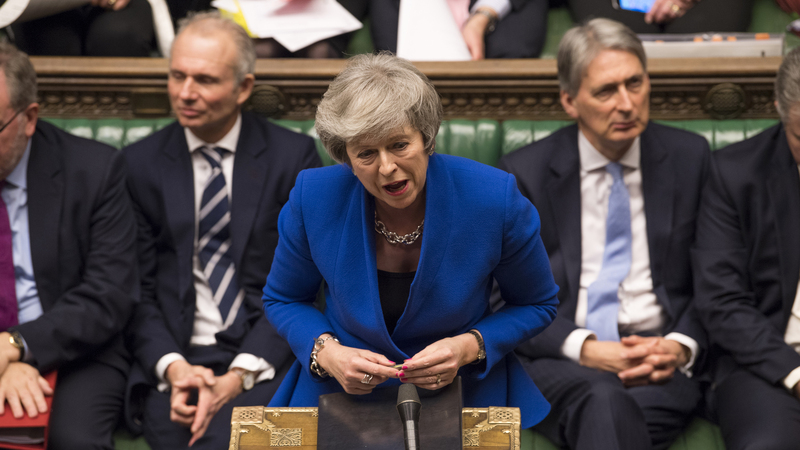 British Prime Minister Theresa May survived a no-confidence vote in the House of Commons on Wednesday, a day after the stinging defeat there of her Brexit deal with the European Union. In the vote, 325 lawmakers said they had confidence in May's government, while 306 voted that they did not. Jeremy Corbyn, the leader of the Labour Party, had called for the motion just after Tuesday's resounding vote against the Brexit deal that May had negotiated with the EU. That vote saw 202 members of Parliament side with May's plan, while 432 opposed it — the biggest defeat for a British government in Parliament in modern times. If the motion had passed, it could have triggered a general election and a possible Labour takeover of government — which meant that many Conservatives were unwilling to cast a vote against May, even if they opposed her deal. The no-confidence vote was supported by all of Britain's opposition parties, the BBC notes, including the Scottish National Party and the Liberal Democrats. Nearly 52 percent of Britons voted to leave the EU in June 2016. Since then, the U.K. has been scrambling to figure out exactly how that will be done. Among the key issues is what Brexit means for the open border between the Republic of Ireland, which is an EU member, and Ireland, which is part of the U.K. The prime minister's "backstop" solution — keeping Northern Ireland in the EU customs union on a temporary basis as both sides figure out a long-term arrangement — was a deal-breaker for critics of May's agreement. Following Wednesday's vote, May told MPs that she would "continue to work to deliver on the solemn promise to the people of this country to deliver on the result of the referendum and leave the European Union. I believe this duty is shared by every member of this house and we have a responsibility to identify a way forward that can secure the backing of the house." She proposed a series of meetings between senior parliamentarians and representatives of her government in the coming days, and she invited party leaders to meet with her individually. In his remarks following the vote, Corbyn said that before any further discussions, the government must rule out the prospect of a no-deal Brexit and "all the chaos that would come as a result of that." There is little that Parliament agrees on, except that it wishes to avoid a no-deal Brexit — which is what it is currently on course for. If the legislature remains paralyzed, the U.K. will leave the EU on March 29 in what most observers say would be a political and economic disaster. Following the rejection of May's Brexit deal, a number of scenarios are possible — but all come with significant complications. One of them is that the EU will give Britain more time to figure out a plan, and continue negotiations. That would require approval by all 27 member nations. Germany and France are said to be willing to extend withdrawal negotiations until 2020, The Times of London reports: "Previous planning had [centered] on a three-month delay to Brexit from March 29 until the end of June but now, according to multiple sources, EU officials are investigating legal routes to postpone Britain's withdrawal until next year." NPR London correspondent Frank Langfitt contributed to this story.